Zoning is the process of planning for land use by the City to allocate certain kinds of structures in certain areas. 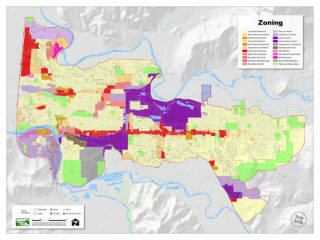 Zoning also includes development standards in different zoning areas, such as types of businesses, height of buildings, density (number of structures in a certain area), size of lots, and use of green space. Standard types of zoning include familiar terms such as residential, commercial and industrial. Other zoning districts may reflect special re-development goals (mixed use zones) or “overlay” other standard zoning areas to alert you to special natural conditions and protections (hillside or flood plain). In Oregon, cities also use both long term comprehensive plan designations and current zoning to reflect current regulations and long range plans adopted by the city. Please review our comprehensive plan and zoning maps. Contact us with any questions you may have regarding the current zoning or development standards applicable to your property!